In my Red Velvet hunt in Barcelona, this place won the first place. Tiny and lovely, with the best cakes for a very honest price! Try also: Cheesecake and Carrot Cake. They are just perfect. 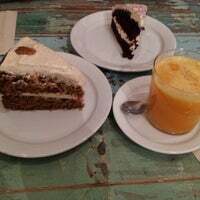 Carrot cake, and vegan cake are great. Bagels are also very fresh. What takes the prize it's the fantastic staff, very friendly nice people working here, if you come enough, you will be at home. Можно слушать вилку))) всем пробовать их знаменитый морковный тортик 😋😋😋 безумно вкусно! Solo con ver la vitrina de pasteles se te hace la boca agua! 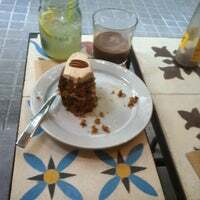 El mejor carrot cake de Barcelona sin duda! La cookie de jengibre también buenísima! Cortado, dirty mocha and carrot cake were all good. Staff helpful and friendly. It's a small place. Half of the customers where "working" there so seat turnaround is an issue. Lovely decor, adorable owners and very good stuff to eat and drink. 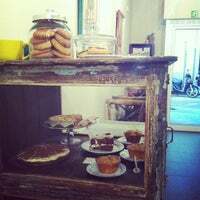 Try the coffee drinks and the homemade cakes (some are gluten-free)! 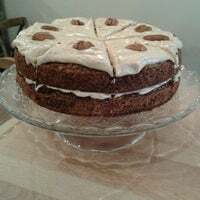 The carrot cake is divine! Juices (particularly flavored lemonades) and mochas are top notch too. 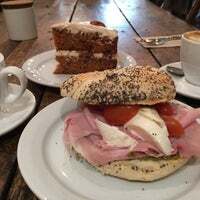 Good breakfast bagels at reasonable prices, excellent service. For dining suggestions, ask the owner. Don't forget to play the tip jar quiz. Great staff, caffe and best carrot cake. It is worth visiting Barcelona only for the cake. 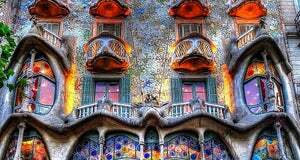 Amazing place! The disgruntled "expertise" reviewer (Olga) below is SO wrong. The cheesecake is 3.75€ not 4.00€ as she wrote, and they always serve generous portions. Some people are never satisfied. Nice place in the lovely neighborhood of Parallel. I tried the carrot cake and red velvet. Late coffee was fine. Value for money. Was pretty good! 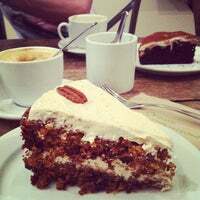 The Carrot Cake is heavenly! Just get it! The raspberry lemonade is also very good! Everything is perfect💕 all cakes, prices are around 3-4 and it definitely worths it. 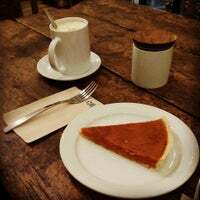 Pumpkin pie yedik oldukça lezzetli. Küçük ve sevimli bir mekan, tatlı fiyatları 3-4 euro arasında. Kahveler de güzel. La tarta de zanahoria está riquísima, aunque he de volver a probar las demás ♥ el café vale lo que cuesta, y el camarero majisimo y entendido. Delicious carrot cake, the best I've tried in barcelona so far. Carrot cake y raspberry lemonade increíbles. Vale la pena pasar a merendar. This place is so good, that when I took the plain takeout box to Koska, a few blocks away, the waiter asked us if that was from there and complimented on the good taste. 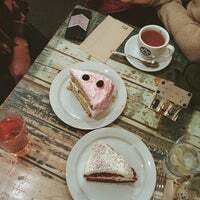 Delicious cakes. 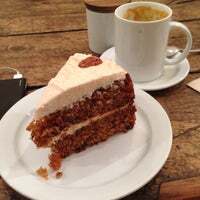 Carrot cake is good (a bit too sweet for my taste). Small and crowded. Cakes caseras deliciosas, café perfecto, servicio adorable... Cómo no había venido antes??!! Tartas deliciosas, con una ración es suficiente para 2. Local pequeño y casi siempre lleno, id con tiempo.Al loro el pastel de Oreo. Los pasteles caseros de Isidre son lo más. 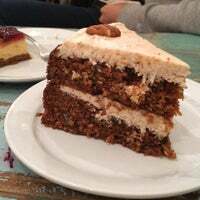 Su carrot cake es espectacular. El café, perfecto. Pasteles para todos los gustos, no hay que dejar de probar las oreod gigantes caseras! 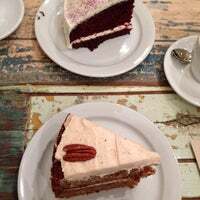 Carrot cake and Red Velvet is amazing. Just amazing. Hidden gem in Barcelona. The coffee and the service are fantastic! Haven't eaten anything here yet but it all looked good. Amazing carrot cake! Really nice staff and atmosphere! He vuelto más de un año después de mi primera visita y he probado el Cake de Oreo...y ¡ay omá! AMAZING! Excellent vegan coffee with the swedish oatly milk! The carrot cake is to die for! A lovely place for cake and tasty bagel ! 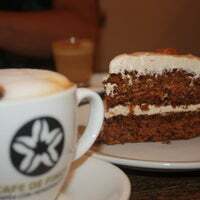 Cosy atmosphere, great coffee and amazing carrot cake. Debe ser que están de recortes porque ha sido pedir un trozo de cheesecake para llevar, llegar a casa, abrir la caja y ponerme de mal humor. Es vergonzoso que se atrevan a cobrarte casi 4€ por esto. 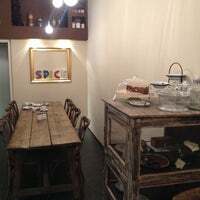 Spice Café is an independently owned coffee shop in the heart of Poble Sec. The café offers delicious homemade baked goods, coffee, and free wi-fi. "Good place for work and some coffee. 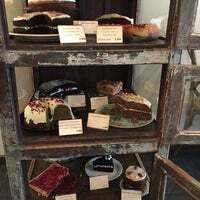 Cakes looks amazing, although I haven't tried it"
"Chai batido (milkshake) is the way to go. Their salads are sizeable and tasty too. Lastly, I love the space." "Very cozy place. Delicious toast with tomatoes and ricotta. Fresh bread and a very good quality of coffee." "Don´t miss the opportunity of going to the roof and watch the superb views of the Magic Fountain, Poble Espanyol, Plaza España and Fira Barcelona!"